This is an update to the original Glissandos script included in Scriptorium 10 years ago. Steve Tavaglione got in touch asking if it was possible to set the length of a glissando precisely, in bars or seconds, and then have the glissando end on specific pitches. So we ended up turning the original glissando approach on it’s head, and targeting the played notes rather than starting from the played notes. This means that the glissando will end it’s glide on the note you play. I call this “Destination Mode”. In Destination Mode you can set the length of the glissando in Beats or Seconds, and the pitch distance (in semitones) from which to start the glissando. The original method is still included as an option, you can choose with the switch at the top right. Origin Mode is the original method in which we start the glissando from the played notes and slide infinitely away from that at a variable rate. 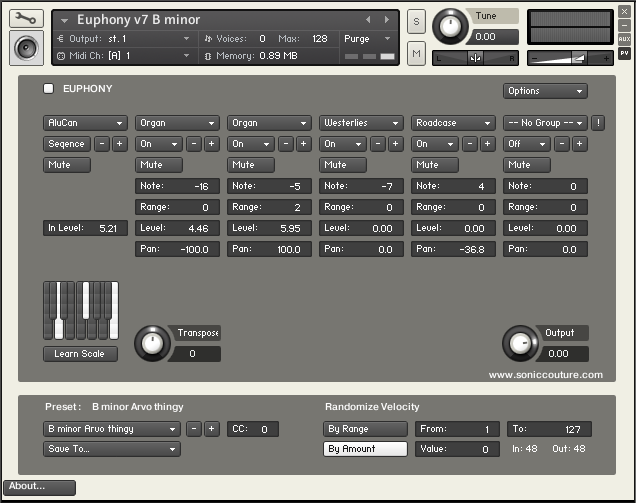 The “Sustain Mode” option also at the top right simply tells the glissando algorithm to either respond to or to ignore the sustain pedal. Works with Kontakt 5.6.8 or later. This script has been festering on my hard drive for years, so I thought it was about time to release it into the wild. 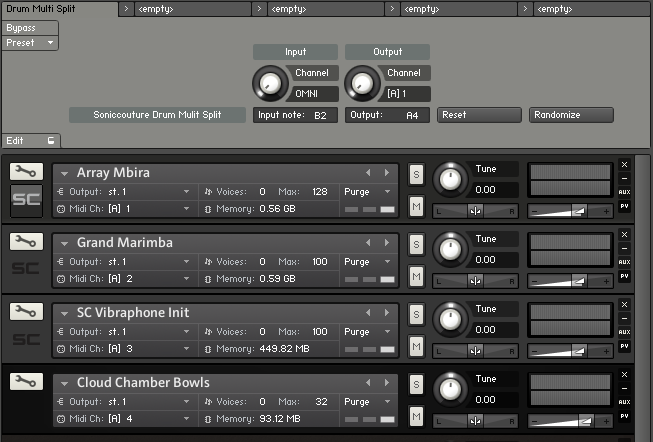 It’s a harmonizer script that adds voices to an input melody. You can limit the harmonizations to a key or a chord so that the result is somewhat harmonious. There are a lot of controls, but each is just a “voice” repeated. The panel is organized into 6 main columns in the top, each of which represents a harmonic ‘voice’. The leftmost column is your played INPUT voice, so this has slightly less controls than the others. For each voice, at the top there is a menu that selects the Group. I like to use this with lots of different timbres on different groups, but you can set them all to the same group if you like. Below that, on the second row, you can turn the voice ON or OFF or into ROTATE mode. If it’s off the voice won’t sound. If a voice is in Rotate mode it will take turns, round robin fashion, with any other voices that are also in Rotate mode. The little plus and minus buttons on the second row just increment or decrement the group. The third row is Mute buttons, you can guess what those do. Then for each voice you can set the Note (which is an offset from the input note), a Range (which is a random amount added to Note), as well as the Level and Pan of the voice. In the middle far left there is a small keyboard that gives you a pitch set which restricts the movement of the harmony. It DOESN’T restrict your input playing though. And then there is a master Transpose and Output volume. In the very bottom you have the preset management system and a random velocity tool. You can name/store up to 64 presets within the script, and you can export and import those using the Options menu at the top right. Works with Kontakt 5.1 or later. Many thanks to the wonderful Judd Miller, who provided endless ideas and feedback for this script as well as some sublime performances. In the post about Keyboard Split I mentioned that the same script could be edited to enable every input note to have a it’s own output channel and MIDI note. Nobody took up the challenge, but a couple of people wrote with ideas about how that should be done, so here’s the version I’ve made. The original idea was that this would be useful for building large multi-channel drum kits, since each note can be sent to any channel or output note. But it’s also interesting with pitched instruments to build up prepared-piano-type patch ideas in which each note has a different sound. On the script panel you can set the input channel to OMNI or else select a single input channel if necessary. The Output Channel and Output Note can be set independently for all Input Notes. If you hold down ALT when you adjust the Output Channel, all the notes will have the same Output Channel. If you click Reset, all the notes will be set to the input note, a kind of default map. If you click Randomize you’ll see another page with some parameters for randomising the setup. Here you can set the From and To limits for the Channel, as well as the From and To limits for the Notes to Randomise. Using this carefully you can safely randomise just a section of your setup, even if you’ve edited another part of the keyboard by hand already. You have the option to Cancel, or else “Do It!”, after which you’ll be returned to the main page. The script will be saved with a Multi, so save your Multis to save your setups. It may be quicker to replace instruments in a multi than to carefully arrange a pattern of note/channel routings with the script. Thanks to Jörg Schwickerath and Christopher Merritt for their input and feedback. 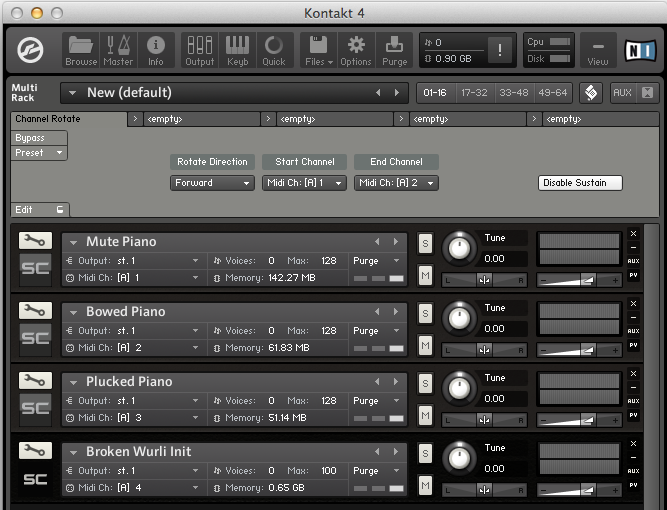 Works with Kontakt 4.2.4 or later. Binaural Beats is a complete rebuild of an earlier script in our Scriptorium package, originally titled Brainwave Detune. This is a special kind of detune effect. Usually detune is specified as a constant cents difference between two signals, but Binaural Beats detunes by a constant frequency difference. This means that the beat frequency between the signals is constant across the keyboard range. 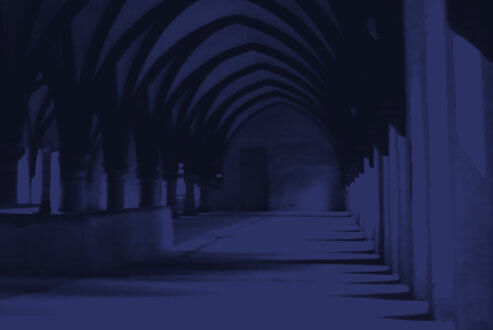 This is an effect often found in new-age binaural beating meditation recordings. Folk wisdom suggests that when these frequencies are perceived by the brain within binaural audio, the brain becomes entrained by the frequencies and enters a similar resonant pattern itself, thus putting the listener into a desired mental state. There is absolutely no medical or scientific evidence for this. In Brainwave Detune we offered a few fixed Brainwave choices, but in the remarkable Binaural Beats II update you can now dial in an exact Hertz value for the Detune amount. Note that for the Hz values to be absolutely correct you need to be playing in A440 equal temperament, although the effect will work in any tuning. Delta, 0.5 to 4 Hz. This is region of your brainwave resonance when you are extremely relaxed or in a very deep sleep. Theta, 4-8 Hz. This region of frequencies is displayed when you are in deep meditation or thought. Alpha, 8-12 Hz. A relaxed but alert state of mind. Beta 13-20 Hz. Highly alert or perhaps agitated mind. The Width control pans the signals out in the stereo image. For truly binaural beats, they should be panned 100%, but often the effect is more obvious in mono (0%). It is a rather subtle effect if you don’t already know what you’re listening for. Oddly enough, traditional Balinese gamelan is detuned in the same way, that is with a constant beat frequency between instruments (and octaves). Typically Balinese tuners aim for a beat frequency of between 6 to 8 Hz, which they liken to a shiny or glimmering effect on the music. In the comments of the last KSP post Kevin suggested an idea for a channel rotate script, much like the Alternate Assign MIDI mode of some early Yamaha synths like the TX-81Z or TX-802. In this mode, each note received was sent to a successive channel in the multi. It made for some interesting sequencing possibilities, or even a kind of random chord divisi system. You can set the type of rotating “direction” with the pull-down menu on the left. The choices are Forward, Backward, Back and Forth, or Random. The range of start and ending channel are set with the Start and End Channel menus. Note that it’s up to you to make sure these channel slots are occupied or not: the script rotates through the defined channels, NOT the loaded instruments. You can use up to 64 MIDI channels in Kontakt. Continuous Controllers are slightly strange for this script. I’ve decided to route them to the current channel, that selected by the last received note-on message. Since you can hold down many notes, this means that the current channel can be changed before a given note is finished. The Sustain Pedal (CC 64) is therefore a particularly dangerous controller, so if the Disable Sustain button is switched on all Sustain Pedal messages will be ignored. You can turn this off tho, if you like living dangerously.